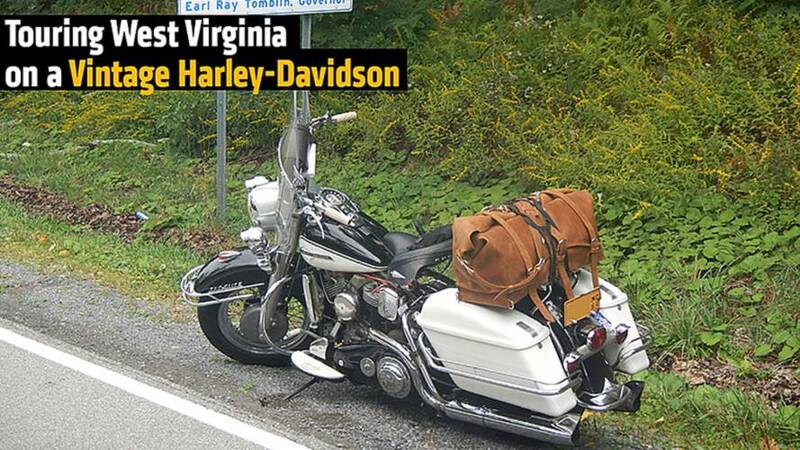 A trip through the West Virginia countryside on a 1964 Harley is as cool as it sounds. When it comes to riding in the mountains, my 1964 Harley-Davidson Duo-Glide is easily outmatched by even the tamest of modern bikes. 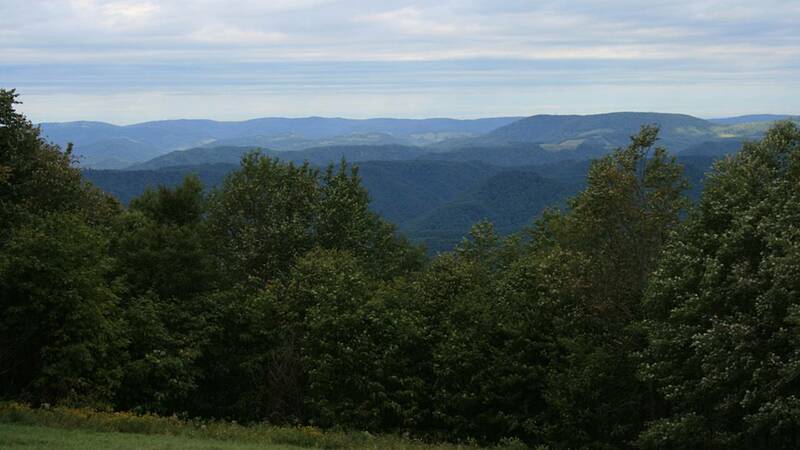 My latest mountain adventure took place in “Wild and Wonderful” West Virginia. It’s about half a day’s ride from my home in central North Carolina to Elkins, WV, which served as my base of operations for three days of riding. I was joined by about 100 other riders, all similarly afflicted with the vintage bike addiction and members of the Antique Motorcycle Club of America. We rode together in an event the AMCA calls a Road Run. The AMCA holds Road Runs a few times per year, in different locations across the US and all involve multiple days of riding from a central location. Not having to carry all of your luggage with you the entire ride really makes a difference and you have the added bonus of getting to know the surrounding area better than if you just rolled through on your way to the next stop. AMCA Road Runs are packed with classic bikes. Another benefit of the Road Run is that you are provided with a detailed route sheet and map covering the rides for each day of the event, which has been carefully thought out by the organizers of the event. Lunch recommendations, gas stops and points of interest are all included, meaning you don’t have to plan anything but how to get to the start. The first day of riding took us on a 223 mile loop, south of Elkins. This was the longest ride of the event and also the most challenging. The roads were twisty, but well maintained and the best riding was on the 43 mile long Highland Scenic Highway. This stretch of Route 55 is the highest major roadway in the state offering excellent views of the Monongahela National Forest. A view captured from one of many scenic overlooks. For day two, we reduced the mileage to under 200, this time making a loop east of Elkins. Again, the roads were excellent (you can hardly find a bad road in this part of the country), but of particular note was Germany Valley Road. This was just a short ride of about 6 miles, but it was on an unmarked one lane road right through farm country. We cruised through rolling hills and high country meadows passing farmers hard at work in their fields. It made me wonder if any of the antique bikes on the run had first been ridden on roads such as this, back before everywhere was connected by four lane highways. 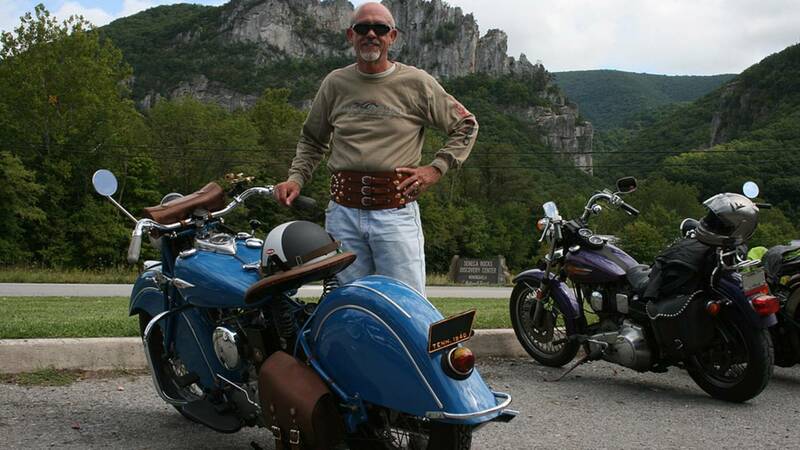 A great looking 1940 Indian Scout with Seneca Rocks looming in the background. The final day of riding was a short 100 mile loop, this heading northbound. As part of the event, there was a photographer on hand snapping pictures as we rode through a covered bridge in Philippi on Route 250N, which made for a nice souvenir of the event. Coal mines have given way to cleaner forms of energy. 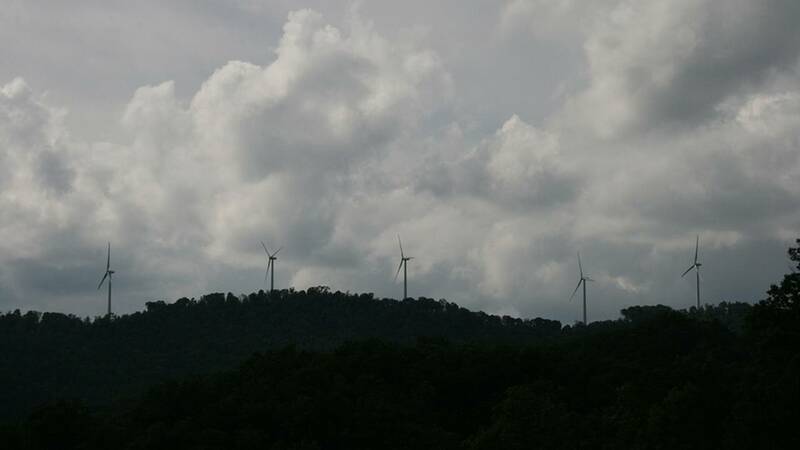 Wind farms were seen on many mountain ridges. On a trip like this, motorcycle riding is of course the main focus, but being able to break up the day with some interesting destinations makes for a much more memorable time. Surprisingly, there was a lot to see and do within just a couple hours of Elkins. One of our first stops was at the Blackwater Falls State Park. As you might expect, this was your quintessential waterfall with wooden walkways, overlooks and miles of hiking trails. 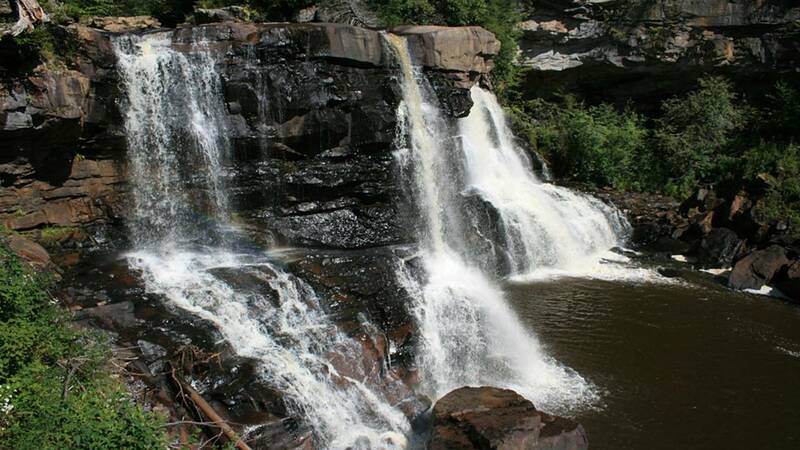 Blackwater Falls plunges over 60 feet to the river below. On the complete other end of the spectrum was our stop at the National Radio Astronomy Observatory at Green Bank. 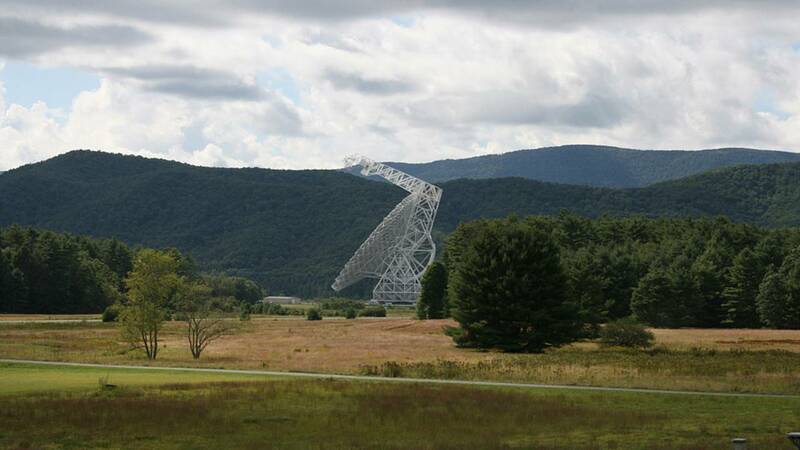 Shielded by the Allegheny Mountains and located in the National Radio Quiet Zone, the observatory’s main attraction is a massive 100-meter single dish radio telescope (the largest steerable radio telescope in the world). Have aliens been contacting West Virginia? 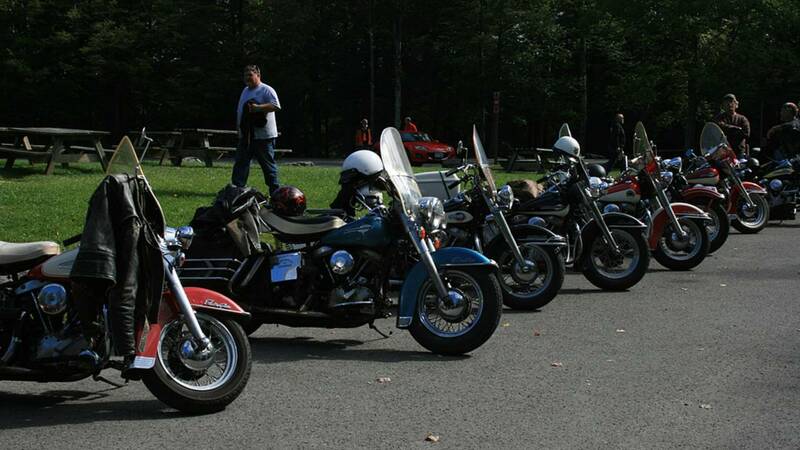 Perhaps more in line with the antique motorcycle theme was a visit to Cool Springs Park. 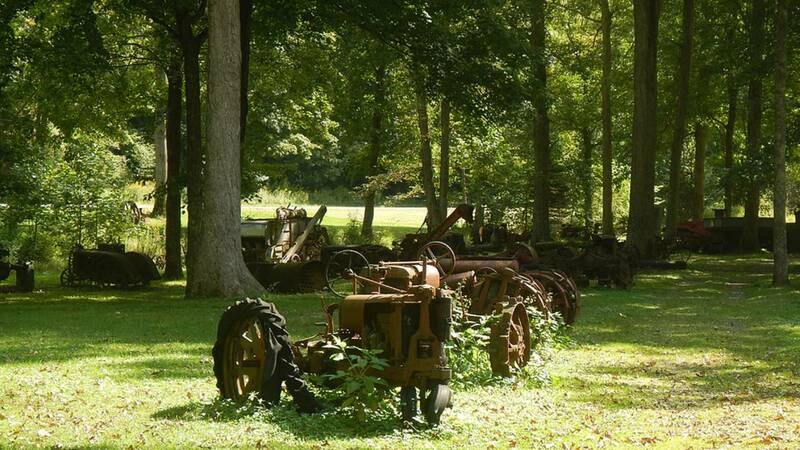 Besides having a general store and restaurant, the Park was also home to acres of old farm equipment. Tractors, plows and even train cars are spread across the property. Worth checking out, but make sure your tetanus shot is up to date before your visit. More rusting tractors than you've ever seen on one place. I’d be remiss if I didn’t mention a word or two about the nightlife in Elkins. 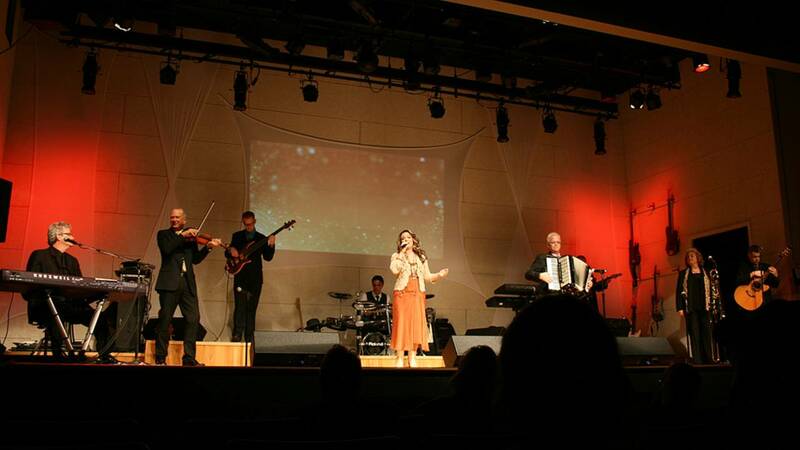 There are a number of bars and restaurants, but if you really want to experience a true piece of Elkins you should check out the variety show at the American Mountain Theater. These guys and gals put on an entertaining show with plenty of singing, dancing and comedy. Almost the whole cast is related giving the show a real down-home feel. Being from North Carolina, I am just a few hours from some of the best motorcycle riding in the country. Whether you want to take your time and cruise down the Blue Ridge Parkway, scrape your pegs on the Dragon or ride something in between, North Carolina is a great destination. With that in mind, you should not take it lightly when I say that motorcycle riding in West Virginia is even better. The lower population density and smaller tourism industry results in roads that are much less crowded than what we see down in NC. Sure we got behind the occasional log truck, but most pulled over at the first opportunity to let us pass. The only downside to this more rural part of the country was making sure I took advantage of every gas stop, but for a modern bike, this would not be an issue. The layout of the roads also made for a much more relaxing ride. There seemed to be fewer blind curves and even though there were long sections of steep grades, they were generally straight. Probably the best part of the ride was I didn’t have any serious breakdowns. My clutch cable did break on the way into town, but that was easy enough to fix. If you are planning a trip to see the fall colors or just looking for some great riding, then Elkins, WV should be on your shortlist. With their combination of good roads and interesting things to do off the bike, you’ll be glad you made the trip.